Among the group of early Christian writers known as the Apostolic Fathers, St Polycarp, whose feast is kept today on the traditional Roman calendar, is the one about whom we know the most. He was a disciple of St John the Evangelist, who appointed him bishop of Smyrna in Asia Minor, and the teacher of St Irenaeus of Lyon, who wrote the following about him to the Gnostic heretic Florinus. In addition to these stories preserved in the Ecclesiastical History of Eusebius of Caesarea (5, 20 & 24; 4, 14), there also exist a letter of St Ignatius of Antioch written to Polycarp, whom he also mentions in two of his other letters, and Polycarp’s own letter to the church of Philippi, which St Jerome records was still read in the churches of Asia in his own time. 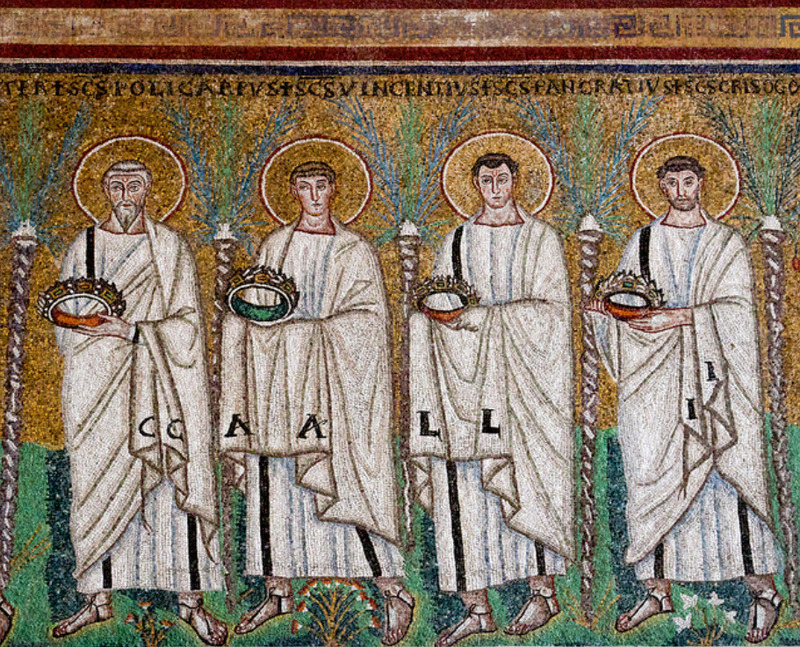 This letter begins with a commendation of the Philippians for their devotion to the martyrs. 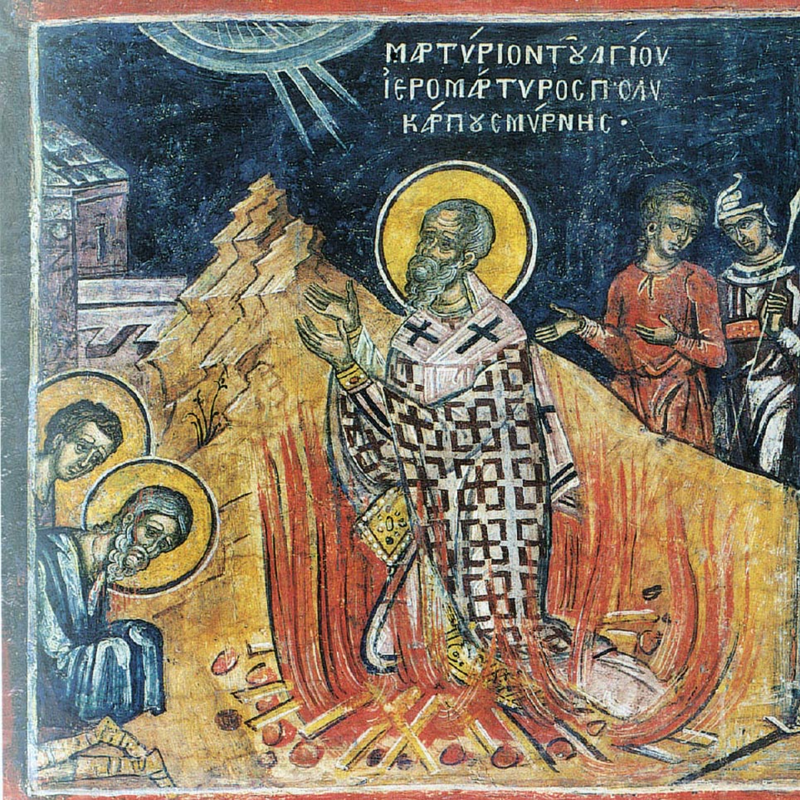 Of Polycarp himself, it is also recorded that he met St Ignatius as the latter passed though Smyrna on his way to martyrdom in Rome, and kissed his chains. When he was sentenced to be burned alive, the soldiers were going to nail him to the pyre, at which he said, “Leave me as I am; for He that gives me strength to endure the fire, will also enable me, without your securing me by nails, to remain without moving in the pile.” He was therefore only bound with ropes, “like a distinguished ram [taken] out of a great flock for sacrifice, and prepared to be an acceptable burnt-offering unto God.” The letter also records his prayer spoken before the pyre was lit. However, once the fire was set, it billowed out around Polycarp “in form of a sail” and although he seemed “like gold or silver glowing in a furnace,” would not consume him. This is one of many famous examples of the refusal by Nature itself to cooperate with the persecutors of God’s Saints, forcing them to take the matter into their own hands, and accept responsibility for the evil which they do. At this, his side was pierced with a dagger, and the flow of blood that came forth was so great that the flames were extinguished. It is an oddity of hagiography that although St Polycarp and his martyrdom are so early and so well-documented, his feast is not an ancient one in the West. It is attested at Rome in the mid-13th century, but missing from printed editions of the Roman Missal and Breviary as late as the 1520s. His place on the calendar was only solidified in the Tridentine liturgical books, which were very much concerned to assert the continuity of Catholic tradition (such as the veneration of relics) with the most ancient days of the Christian faith.